Positive Leadership™ The Game is an interactive card game designed for leaders of all levels that helps you generate innovative solutions to business problems through structured brainstorming. Played in groups of 3-10 people, this game uses the underlying principles of positive organizations to spark multiple strategies for leading positive change and development. 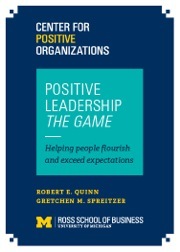 To request a teaching note for Positive Leadership™ The Game , please email pos-tools@umich.edu. To purchase Positive Leadership™ The Game , please click the “purchase” link to the left. *Shipping prices vary based on quantity and shipping location, if you have questions about shipping rates, please email pos-tools@umich.edu. Group Workshops: Groups of approximately five people can play the game in its intended form to share positive leadership strategies and solutions with each other. Business Discussion Topics: Organizations can use the positive strategy cards to generate strategic discussions and spur innovative thinking. Inspirational Leadership Quotes: Individuals can use the positive strategy cards as inspirational quotes or advice in a business setting. Cameron, Kim, Dutton, Jane, and Robert Quinn. Positive Organizational Scholarship: Foundations of a New Discipline. San Francisco: Berrett Koehler, 2003. Print. Cameron, Kim, and Gretchen Spreitzer. Oxford Handbook of Positive Organizational Scholarship. New York: Oxford University Press, 2012. Print. Dutton, Jane, and Gretchen Spreitzer. How to be a Positive Leader. San Francisco: Berrett Koehler, 2014. Print.